In the Nordmarkt quarter of the intercultural Nordstadt neighborhood in Dortmund, the computer club came to live in summer 2009. The neighborhood stands out in the city not only because of its cultural diversity, but also because of its young age structure. Many families and children live here. But social and economic conditions are often difficult; unemployment is high, and access to education often difficult. So the demand for a computer club was obvious, when the school, the come_IN team at the university of Siegen, local residents and neighborhood managers, as well as Wissenschaftsladen e.V. and Chaostreff worked together to establish the club. We make things that make things! – We combine disposable materials, electronics and programming in a tinkering project. 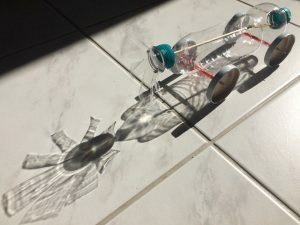 The result is “things that make things”: homemade figures, or objects that drive, shake, light up, make noises… Let’s see what we can come up with. Treasure hunt! – In Scratch we’re designing and programming our own little treasure hunt games. Radio Libelle – The second radio broadcasting project of the computer club. We’re investigating topics in and around school and prepare them for our own broadcast. Upcycling – We’re designing and crafting cool new artefacts from trash materials. And with this, we’re also exploring, why plastic, paper & Co. are problematic and how this trash can be reduced or even avoided. Fly, Dragonfly! – We’re building vibrobot insects. Coding Expedition – We’re programming a world in Scratch. Animal World Travels – Computer club participants send 2-dimensional trackable-animals on a geocaching-world tour. Inventor’s Shed – Children design and build crazy machines with the help of littlebits. 3D-Modelling – While these trackables are on their way, the computer club explores 3D-modelling by building and printing 3-dimensional animals and other objects. 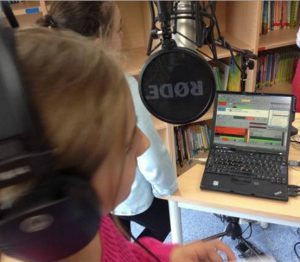 Dragonfly Radio – Children in the computer club create and produce their own radio broadcast. Monstermaking – Children in the computer club sew and program interactive monsters. 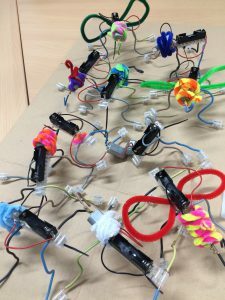 Dragonfly World Tour – Club participants send self-made dragonflies as so called ‘trackables’ on a Geocaching World Tour. Dragonfly News – Children in the computer club create a newspaper with self-made reports about their new school. Bunny Bright – The computer club explores the basics of electronics. Participants create little interactive stuffed animals from felt. Dragonfly Mosaic – After its move into the newly built school building, the Vincke-School renames itself into ‘Dragonfly Elementary School’. Reason enuogh for the computer club to learn a lot about dragonflies by creating little animations, pictures and games. 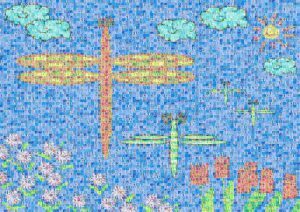 Also, the club invited all the children in the school to participate with a self-made dragonfly picture in a large mosaic of the school’s new logo. Calendar – Computer club participants create calendars with self-made pictures and photos. Games from around the world – Children and their parents from the computer club research games from their respective countries of origin. These games are then built and collected in a ‘box-of-play’. At a neighborhood-wide ‘day of play’, the computer club invites children and adults from the neighborhood to come and play these games with them. Computerpuzzle – Children and adults in the computer club explore the parts and functionalities of a computer from the inside by tearing it apart and putting it back together again. 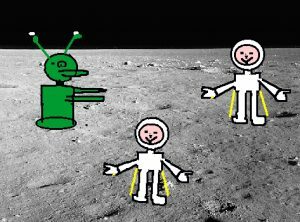 Scratch Stories – Little animations and stories are created from self-made pictures and photos. Trickfilm – Production of an adventurous world travel of two little astronauts as an animated cartoon. Audio Play – Children create and produce a 10-minute audio play from an episode of their current favorite book.